Gum disease is a progressive disease that significantly harms the health of your gums, teeth and your jawbone. Untreated, it can eventually lead to tooth loss. The bacteria that cause gum disease can even enter your blood stream, and cause all kinds of other health issues. If you have diabetes, your risk for developing gum disease is much higher than those without it. And if you develop gum disease, it can wreak havoc on your diabetes. Taking the appropriate measures to protect your gums can help in the effort to keep your diabetes under control. How is Your Risk Increased? 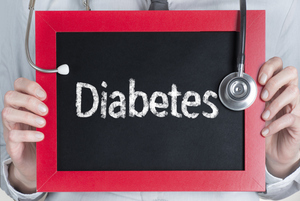 If you have diabetes, your blood sugar is often higher than someone without. This sugar can also be found in your mouth, and is a favorite food of oral bacteria. Diabetes makes it more difficult for your body to fight off infections, so when bacteria attack your gums, they are more likely to succeed in irritating and inflaming the tissue. Without the ability to effectively fend your gums from the attack, gum disease can quickly manifest and progress. Gum disease in an infection. As with any other type of infection, it can have a negative impact on your blood sugar levels, causing them to spiral out of control. This then becomes a vicious cycle, where your diabetes makes it hard to fight infection, but the infection makes it hard to get your diabetes under control. All is not lost. There are things you can do. You must take steps to prevent gum disease while taking steps to control diabetes. Monitor your blood sugar. If they are not where they should be, speak with your doctor about how to get them under control. Brush your teeth at least twice a day and floss daily. Don't forget to visit your dentist at least twice a year for cleanings and exams. Your dentist is highly trained in spotting potential issues and stopping them before they become serious. Make sure, though, that your dentist knows about your diabetes, as it can play into any necessary treatments. Proper oral hygiene and taking steps to manage your diabetes are essential for protecting your gums, as well as your overall health. Be sure to speak with your dentist and discuss your concerns. And, if you notice any symptoms of gum disease, contact our office right away.